As always, I like to use the WordPress plugin Contact Form 7 as a basis for all my form-driven projects. The reason is that Contact Form 7 has a robust validation mechanism. It is very lightweight, yet powerful and easy to use for both intermediate and advanced users. And lastly, because there is a great many plugins that build on top of CF7. These plugins allow you to turn CF7 in exactly the solution you need for your project. Nothing more, nothing less. But enough praising CF7, let’s build a form already! Let’s save this file as make-model-year.csv to our /wp-content/uploads/ folder. // setup the initial array that will be returned to the the client side script as a JSON object. You should add this after the form is loaded. Typically you would create a custom page-template where you would include the form, or you could use an action hook to output the script, or add it to a seperate .js file. But for simplicity’s sake, we’ll just add it to footer.php, right before the </body> tag. So without further ado, here’s the script. // create references to the 3 dropdown fields for later use. // action needs to match the action hook part after wp_ajax_nopriv_ and wp_ajax_ in the server side script. // pass all the currently selected values to the server side script. // call the server side script, and on completion, update all dropdown lists with the received values. And the contact form 7 form itself? Simple! 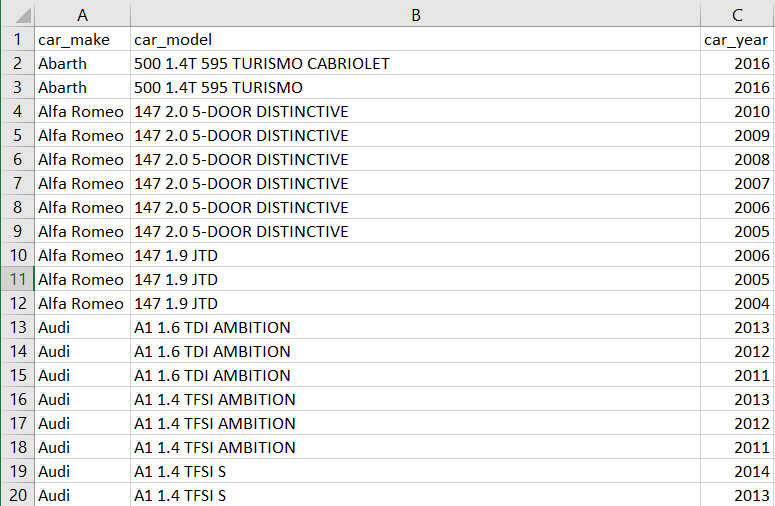 just add 3 select boxes with the names “makes”, “models” and “years”.